I still have my registered copy of Word 5.1, and it still works with OS 9.1 and 9.2. I guess there are some minor incompatibilities with certain features under OS 9, and patches are available to deal with them, but I’ve never bothered to follow them up since all I use Word 5.1 for these days is for opening archived documents, occasionally producing a Word formatted document for compatibility purposes, and on the rare occasion these days that I print anything, Word 5.1 still talks to my old ImageWriter II printer more slickly and conveniently than any other application. 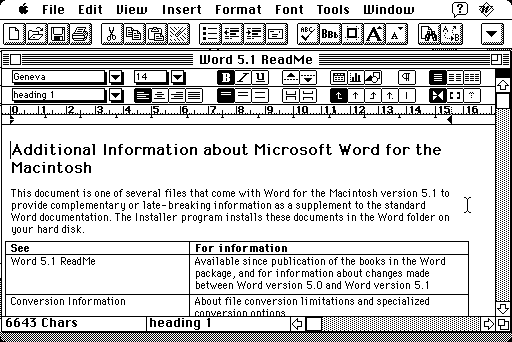 I switched from Word 5.1 to Nisus Writer for word processing in 1998. I didn’t like Word 6, and I thought Word 98 was just too ponderously bloated. Nisus was, well, nicer, and it is a better text editor then Word, although less powerful and versatile for near-DTP formatting and the like. However, I continued to use Internet Explorer and even experimented a bit with Outlook Express for email, although I never really liked its multi-pane interface, and I hated the way it dumps all archived messages into one, big, proprietary, and too easily corruptible file – an affliction that still pertains to users of current versions of Outlook and Entourage. For a while, I considered IE 4.5 to be the least objectionable Mac browser – the best of a scurvy lot at the time – but once Netscape 4.5 was released and the iCab betas became stable, I happily switched to them and never looked back. And in the fall of 2000, disgusted by what had been revealed in testimony at the Microsoft antitrust trial and alarmed at Microsoft’s increasingly aggressive designs on controlling the Internet, I decided to purge all Microsoft software, save for my ancient copy of Word 5.1, from my hard drive. That basically meant getting rid of Internet Explorer (by then version 5, which I didn’t like anyway) and Outlook Express, along with all the shared library junk they had dropped into my System Folder. Things are arguably a bit better in OS X, since when buggy MS software craps out under OS X, it doesn’t take the whole system down with it, but there’s still plenty of reason to shun Redmond when you’re running OS X. Applelust’s Pierre Igot recently posted a column on just how bad Office for OS X really is. And in a recent conversation with a member of another major software outfit’s development group, I was informed that Internet Explorer is a major contributor to conflicts with the OS X version of their application. I appreciate that Microsoft Office’s cross-platform compatibility enables many users to continue using a Mac in a Wintel-oriented world, which they would not otherwise be able to do (at least not conveniently, if there were no Office for the Mac). I will not argue with that rationale. However, that doesn’t explain why Mac users have to use Internet Explorer for browsing or Outlook Express/Entourage for mail when file compatibility is a non-issue in either case. There are plenty of non-Microsoft browsers and email clients available that work just fine. Then there are the hordes of Mac users for whom file sharing with PC users is not a major issue, but who still, lemming-like, insist on using Word for word processing, and, of course paying, through the nose for the dubious privilege. Word actually has a higher market penetration on the Mac platform than on the PC. Go figure. 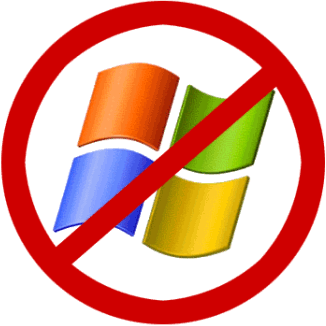 However, my advice is to avoid all Microsoft software that you don’t absolutely have to use. Why give aid and comfort to a company that wants to control your interaction with your own computer and with the Internet, obliging you to pay handsomely for both (and if you think Internet Explorer and Outlook Express will remain free of Microsoft is ever successful up in crushing their competition, you’re naivety is remarkable). There are alternatives: Nisus Writer, Mariner Write, AppleWorks, and a gaggle of text editors for word crunching; Mariner and AppleWorks, as well as several shareware applications, for spreadsheet; Upresent and AppleWorks for presentations; Eudora, Nisus Email, SweetMail, PowerMail, Mulberry, and many more for email; Netscape, iCab, Mozilla, OmniWeb, and Opera for browsing. And if you need to open the odd Word document with formatting intact, there’s the handy little icWord shareware utility for that. I’ve been happily Microsoft-free for 18 months now, and I don’t miss either Microsoft applications or the system instability that went with them. Try it. You have nothing to lose but your chains – so to speak.